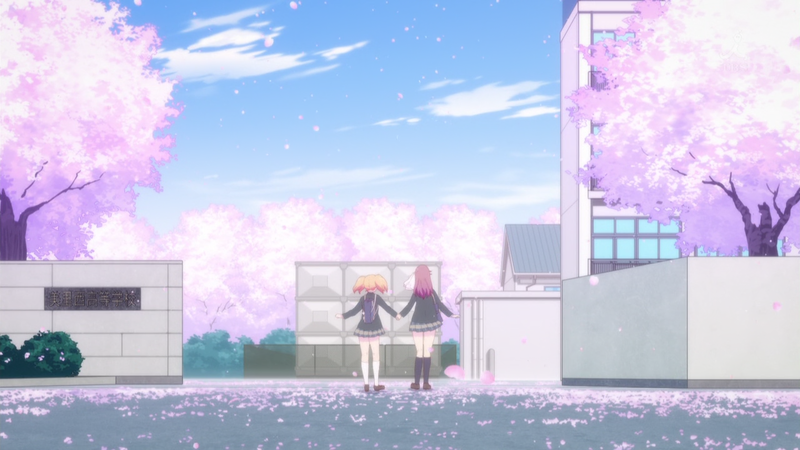 Sakura Trick — 12 | Mezashite! For those of you who waited for us, thank you. For those of you who didn’t, I hope you enjoy rewatching the finale. For once, finally, someone delivered and gave us not only the yuri anime that we’ve been waiting for, but a romantic anime where getting together is not the final point in the series (putting aside Haruka’s retardation). Pretty sure I said I’d never do a sign-heavy anime again after KinMoza, but we just couldn’t pass up the chance for something so well suited for Mezashite! It was again a lot of work, and I know due to various reasons the last two episodes were quite delayed, but I hope you enjoyed Sakura Trick as much as I did. I don’t think my heart will ever be the same again. And since it looks like we’re doing this, Mitsuki best. Actually, I’m pretty sure we decided to do Sakura Trick because of a hastily made snap decision on a groggy Wednesday morning. Also, Kotone’s probably the best girl. This entry was posted in Sakura Trick and tagged Release by Akatsukin. Bookmark the permalink. I agree with yuyu. It was a terrible show. Finally someone has got good taste. Thanks for your work on Sakura Trick. I really loved this anime and the few characters developpement. Kotone is the best girl in my opinion. By the way i used your release to make a french translation Thanks for all. Nice show, nice OP, nice characters (except Haruka). Thank you all for the amazing work! wut. I’d better delete everyone else. Thanks guys. Worth the wait IMO. Didn’t know your group before this show, but I’ll definitely keep an eye on your RSS feed. Thanks for the subs guys, I really enjoyed it a lot. For all your efforts, I truly, truly thank you. It was worth the wait 🙂 Any plans on releasing the BD versions? finally it’s over! I hope that Aikatsu can finally return on time!!! Yuri stinks!!! More Aikatsu! more Mizuki-sama!!! Planning to do GochiUsa for next season? It’s Kinmosa’s “neighbor” btw. well F you yuyu! your opinion stinks. Thanks for subbing this show I hope there will be a second season. Btw, not relate this but do you guys have any plans to translate Kiniro Mosaic 2? Thank you Mezashite! for subbing Sakura Trick! ’twas a very entertaining and cute series, with Hidamari Sketch’s director and all =D See you guys next season! Also, since quite a few people are voting on who’s the best girl, I’ll show Shizuku some love!